Today was another travel day for Phaeton Place as we continued north from Oregon into Washington. 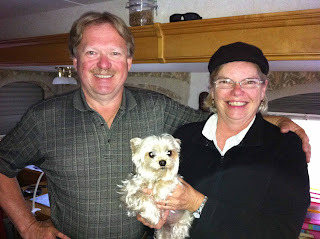 We said our goodbyes to Bent, Sharon and their dog Bridgette. We’ve had a blast traveling with them over the last ten days or so and hope to see them again in Ontario this summer. We drove just over 300 miles from LTR Seaside to TT Birch Bay where we’ll spend a few days before crossing the border back into Canada. Our day began in the rain at Seaside but the rain tapered off to just cloudy skies as we headed east along Hwy 30 into Longview, OR where we picked up I-5 north into Washington. Thanks to reader comments we knew enough to take I-405 as a bypass around most of the Seattle traffic. We stopped at the Super Walmart in Marysville to pick up a few groceries before continuing on into TT Birch Bay. We got here about 4 pm and only half the campground is open over the winter. There are a few occupied rigs but not many, quite a lot of rigs in storage both on sites and around the perimeter fence. We managed to grab a full service site with 50 amp and good satellite reception. A package we were expecting from Tiffin was waiting for us when we arrived but nothing from Leki yet, hopefully tomorrow. This entry was posted in Campgrounds, Oregon, Thousand Trails, Washington. You`ll have to send us an email and let us know your plans for BC -we may in in the LMD later in the Month. Cute pup!! We are currently located in Rufus, OR… We are here until about May 20th and then we head to ID… Another new first for us. We'll work the summer there. Love your photo shots BIG TIME… I'm thinking we need a newer camera.